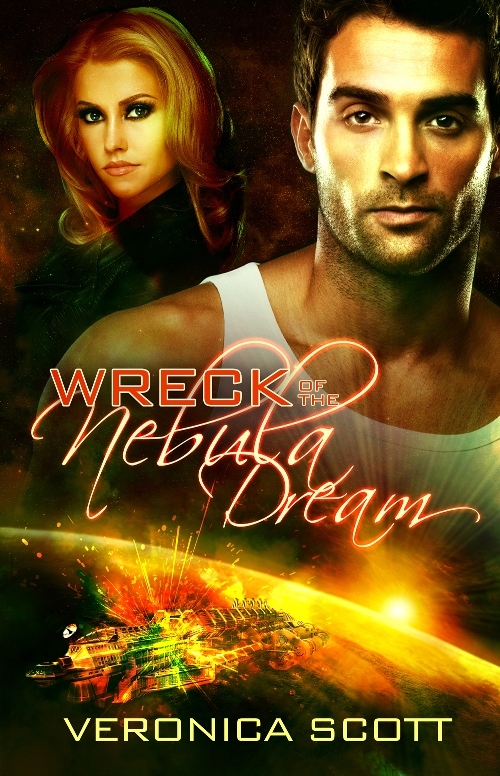 I was poking around on Veronica’s Scott site–she’s incredibly cool–when I saw an awesome looking science fiction title–Wreck of the Nebula Dream. Wow. What’s that? I checked it out. It turns out that it was a science fiction romance billed as Titanic in space. Wow again. I brought it up at Amazon and clicked Purchase. Traveling unexpectedly aboard the luxury liner Nebula Dream on its maiden voyage across the galaxy, Sectors Special Forces Captain Nick Jameson is ready for ten relaxing days, and hoping to forget his last disastrous mission behind enemy lines. He figures he’ll gamble at the casino, take in the shows, maybe even have a shipboard fling with Mara Lyrae, the beautiful but reserved businesswoman he meets. I can’t rave about this story enough. The main character, Nick, is compelling and likable, which is a good thing because 80 percent of the story is from his point-of-view. The story begins in a shuttle as the last group of passengers is being shuttled to the Nebula Dream in the last minutes before its departure. Along the way, Nick has an early chance to be a hero when a superstitious traveler decides to try to kill herself. The opening was a bit contrived and somewhat unnecessary in my opinion, but it did serve the purpose of getting the main characters together. Once on board the ship, Nick somehow scores a personal tour of the ship by one of the ship officers. This tour comes in handy later. He also takes a jaunt up to the observation deck, where he meets a very interesting old lady. Less then twenty-four hours later, the ship is in chaos, and no one knows what is going on. Ms. Scott did a great job sowing chaos into the plot. The first challenge is people mobbing the lifeboats, and due to some unforgivable shortcuts taken by the space cruse line, there aren’t nearly enough of them. Plus, there are gaping holes in the hole, and bulkheads are slamming down everywhere to preserve the oxygen in the ship. What a ride. Everyone has a chance to be a hero. Even the children and the old woman. This is very much a science fantasy, somewhat along the lines of Star Wars. The mythology has nothing to do with anything you’ve ever heard of in Earth history, which makes it all the more cool. In fact, I am not even sure an “Earth history” is intended in this book, although I may be mistaken. The deities plays a role at least two times, the story is open to a sequel involving one of the deities in particular. The story is tense, the romance is sweet, and the villains are ruthless. If you pick up this book, the pages will fly by and you will be absorbed into a story that you won’t easily forget. I think I just read a rather bad former query for this book over in Evil Editor’s classics. I’m so glad the book is published now and that it’s deliciously exiting. Just goes to show that trouble describing your plot doesn’t mean an awesome book isn’t there. Oh, it would be interesting to see that query. I’ll have to look for it. I have not tried to find it yet, but I was going to look. Since there is this interest, I’m going to ask the author about it.